There are currently three Dewalt table saw models available, the DW745, DW744X, and DW744XRS. Dewalt has been in the woodworking tool business since 1924, and is currently part of the Stanley Black & Decker Corporation. Stanley Black & Decker is a global company that also owns Porter Cable, Bostitch, Delta, Stanley, Proto, Facom, and Mac Tools, plus a number of other brands. Dewalt caters to the professional tool user that travels to different jobsites and values portability in their tools. Their portable table saws are designed for everyday use. They come with a 3-year warranty, plus a 1 year service agreement and a 90 day money back guarantee. The Dewalt DW745 is possibly the ultimate portable table saw (with the emphasis on portable). It is one of the lightest, smallest pro-quality table saws you can get. Sure, the rip capacity is limited to 16" (using the fence), but if you are lugging it in and out of your truck and climbing stairs with it every day, this is one of the easiest models out there to handle. It only weighs 45 lbs., and the "roll cage" allows you to grab it and carry it any way you like. Like many portable table saws these days, it has on-board storage for accessories. The newest version has an adjustable height riving knife and a tool-free modular guard system. The feature that gets the most rave reviews though is the fence system. Dewalt table saws come with a telescoping, rack and pinion fence. You move the fence by turning a knob on the front of the cabinet, and the rack and pinion mechanism keeps the fence parallel to the blade. I have played with one a little, and I have to say it is pretty cool! The DeWalt DW745 has a 15 amp motor, a 2-1/2" dust port, and adjustable rear feet for use on uneven surfaces. It offers a max cut depth of 3-1/8" at 90 degrees, but does not accept a dado blade. The miter slots are not a T-slot, but they are the standard size, so many aftermarket miter gauges will work. The DW745 does not come with a stand. Reviews of this Dewalt table saw are excellent overall. I looked at reviews from Amazon (click to view) , Lowes, Home Depot, E-pinions, and several forums and magazine articles. The average rating from all of these sources combined is a 4.7 out of 5 stars, with well over 200 total reviews. HGTVPro.com has a review where the saw owner, a professional remodeler, loves it. It is small and light enough to be easily portable, but does everything he asks of it. He says it has great power, it cuts straight and true, and he loves the rack and pinion fence. 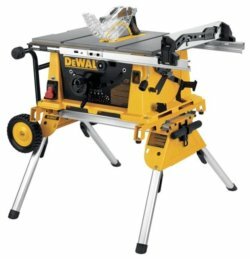 FineHomebuilding.com also has a positive review of the DeWalt DW745. On Amazon, two-thirds of the 150+ owners gave it five stars. When you read the reviews, it appears that some owners that only gave the DeWalt table saw three or four stars expected full size performance out of a portable table saw, and really should have opted for a larger model to start with. As with any woodworking tool, there are a few valid complaints or disappointments. The most common complaints are that the miter gauge is plastic, and the miter slots in the table are wide enough to allow some slop (a frequent complaint on many portable table saws). They may have corrected the slot width issue though, because the miter gauge was a near-perfect fit on the one I looked at. Some owners wish it would accept a dado blade (like the Bosch GTS1031 does). This DeWalt table saw is also rather loud, and starts abruptly (no soft start feature). The general-purpose blade that is included is not the best one out there (but come on folks, do you really expect a $50 blade to come with a portable table saw? Buy a couple of good quality blades, for Pete's sake!). The Dewalt DW744X has similar features and specs as the DW745 above, but provides a 24-1/2" rip capacity and a larger table surface. It uses the same telescoping rack and pinion fence design, riving knife, and modular blade guard setup. The 15 amp motor has a soft start feature, plus an electronic feedback system to maintain blade speed during tough cuts. This DeWalt table saw does not have the "roll cage" design like the DW745, but it comes with a folding stand instead. The body of the saw is completely different, as it is designed to be bolted down to the stand or to a workbench. It has a 3-1/8" max cut depth, and it will accept a 13/16" dado blade. There also is a 2" dust port. The reviews on the DeWalt DW744X overall are good, but not quite as good as for the DW745. The DW744X apparently had a few issues several years ago, and there actually was a recall for certain serial numbers made in 2007 and early 2008. The average rating on Amazon.com is "only" 4.1 out of 5 stars, but a number of those reviews are old. The current version of the DeWalt DW744X apparently has most of those issues resolved. Outside of Amazon, the ratings are excellent, averaging 4.5 out of 5 stars across all the sources I checked. The DW744X also came in first place in a Tools of the Trade magazine comparison test of eight different portable table saws in 2008. However, this Dewalt table saw suffers from the same miter gauge and miter slot complaints as the DW745. Some users have had issues with the fence and blade not holding their alignment. The rack and pinion fence on some examples doesn't seem to be as accurate or reliable as it is on the smaller model, and that may be partly because the fence is 1-1/2 times longer. In features, capacity, and price, the DW744X competes primarily with the Ridgid R4510 and the Makita 2705X1. The Ridgid and the Makita also get good ratings from users, and their stands have the added benefit of having wheels. The Dewalt DW744XRS is essentially the same tool as the DW744X above, but with a collapsible rolling stand that stays attached. Curiously, the current description on the company website seems to be for an older version of the DW744X. It is possible that the "XRS" versions with the rolling stand (as of 04/2013) don't have all of the updates that the latest version of the DW744X has (although I expect this will change as they sell out of the older version). The updates include the adjustable height riving knife and the modular blade guard system. If you have a DeWalt DW744XRS in front of you, you can tell the difference between the older and newer versions by looking at the "Type" number on the nameplate, which also has the model and serial number. Type 4 is the older version that does not have the riving knife or the modular blade guard system. A Type 5 or Type 6 is the newer version that includes the riving knife and modular blade guard. 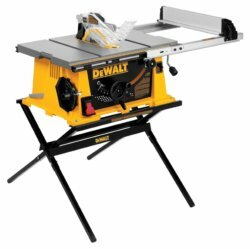 There aren't as many reviews for the DW744XRS as there are for the other two DeWalt table saw models, but overall they are still excellent. Amazon shows over 60 reviews at the moment that average 4.7 stars out of 5. One owner (a contractor) wore his first one out and bought a second one. He says the Dewalt DW744XRS is the best jobsite table saw out there for his purposes. He does say that the first one had issues with fence alignment towards the end. This model tends to get the same miter gauge and miter slot size complaints as the other DeWalt portable table saws. If you read the woodworking forums, you will find the Dewalt DW744XRS compared to the Bosch 4100 table saw. While the Bosch gets more recommendations from other woodworkers, it is also heavier and is currently more expensive than the DeWalt. More detailed specs and information about all of the Dewalt table saws can be found at the Dewalt website. Note: If you are buying your first table saw, or need help tuning up one you already have, I would recommend getting a good book on the subject. The two that are recommended most often on the woodworking forums are Jim Tolpin's Table Saw Magic and Kelly Mehler's The Table Saw Book . Both have good ratings on Amazon, and they cover all the basic operations, as well as safety, maintenance, and accessories. Overall, if you are looking for a portable table saw and one of these fits in your budget, a DeWalt table saw is one of the best choices out there. They offer professional quality and light weight in a compact package that is easy to lug around. Owners love the telescoping rack and pinion fence, especially on the smaller DW745. If a Bosch is a little too much for you price wise or weight wise, you can't go wrong with a DeWalt table saw.